Our Community Playdates are basically an opportunity for you guys to play (and chat) with us, and also an opportunity to play FFA and Team maps if you’re struggling to find people to try those maps with. The idea is to play different maps between 30 minutes to an hour. The room will have the maximum capacity available, but if you miss out, we’ll have plenty of chances to join! And remember to send us map suggestions if you wanna play a map in specific! If you have any questions about these playdates, please let us know in the comments or send us a tweet and we’ll try to answer asap. Welcome to the 9th edition of our Featured Maps! So close to double digits! We’re a bit early this week because we’ll be at RTX Sydney this weekend (come to booth #303 to visit us if you’re going!). So we had to upload this early. But early is never bad right? ;) More time to play! And that’s good because we have 6 maps this week! We’ve seen a few maps that recreate D-Day, and this is one of the good ones! Especially if you like challenging maps. You won’t only get quite a few enemies, but they will be located in a lot of places where you can’t see them or are a bit hard to shoot, so you might die a few times near spawn. The map also has a nice look-and-feel, and it uses our fog feature quite well, hiding enemies and giving the player the feeling like they’re actually at the beach. This map is quite… different. And different in a good way. It might not make much sense at the beginning, but that’s what makes it special. It has a really cool aesthetic, that makes you feel like you’re in a sort of personal hell (which is what the whole map is about, and it has trigger warnings for the same reason). You will fall apparently to your death, but won’t die. You’ll have to go around certain places and find escape routes, and of course, you’ll also have a bit of action. Title: TRON LEGACY! Team Death Match! This map is a futuristic arena divided in two by a big pit of electricity! You only have access to your team’s arena, so you’ll have to fight your opponents from your side just shooting and throwing things at them, but don’t worry! You’ll have enough weapons to snipe them, cut them or simply disintegrate them with negative zones, and you’ll also have some jump pads that will make it harder for your enemies to shoot you, as well as it might make it more challenging for you as well. We picked this map because it really looks like a Paintball arena! You know how paintball arenas tend to look like a war zone, with some small bunker areas in the middle of a vast open space? Well, this map is just the same! And just like it works for a paintball arena, it also works for Gunscape! With a few long distance weapons and enough spots to hide behind, you’ll probably have a lot of fun! This map is a tribute to the original Half Life game. If you like the Half Life games, you’ll probably like this one. The look-and-feel does make you think that you’re in one of the games, and it has just as much action as the actual game! The campaign is also a work in progress, so we can't wait to play the other maps of this campaign! This map is a bit different in design, as it emulates the green screen in a studio. So you’re basically battling in a tv or film studio. The map itself is basically an arena in the middle, with the big green screen (that you can climb, and you might find some things at the top of it…). But you also have rooms and passages to each side of the arena, so you can always decide to play some hide and seek if you prefer! If you’re enjoying any other map, or if you just finished your own and want to show us, just leave a comment here or on our forum, or drop us a message on our forum or any of our social media accounts! 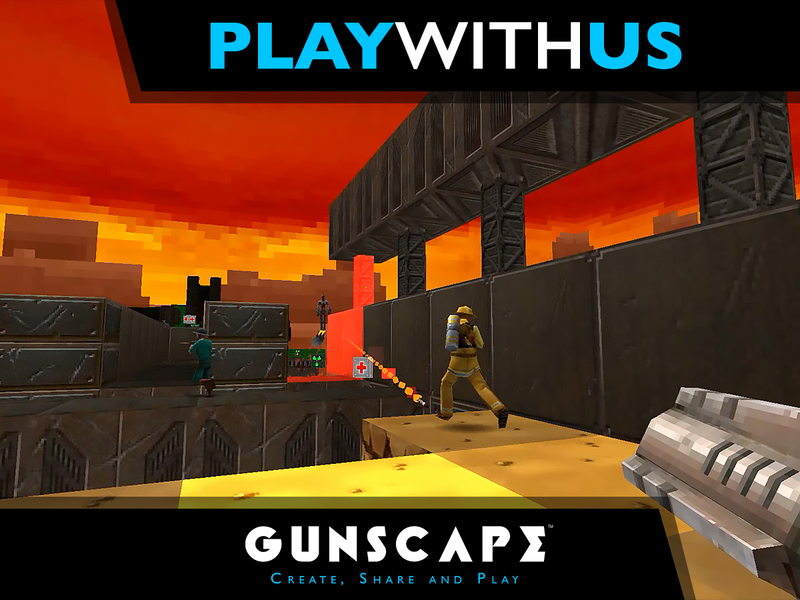 Do you have Gunscape? Do you want to play with us or play with the community? Then join us! 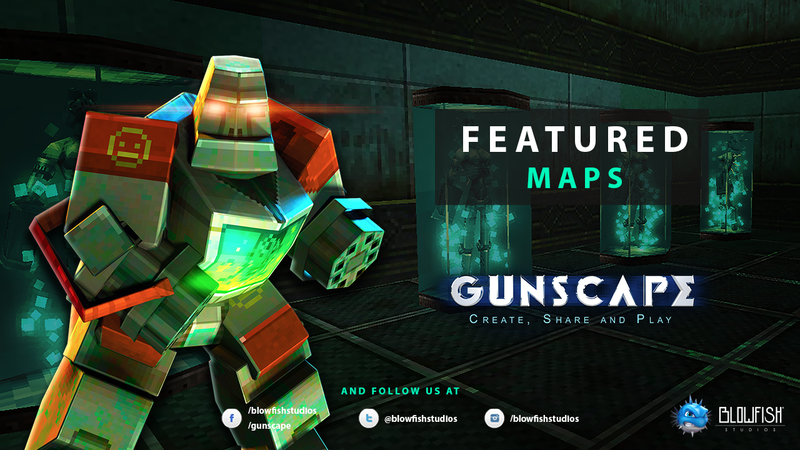 Yes, we’re bringing our Gunscape Community Playdates back! 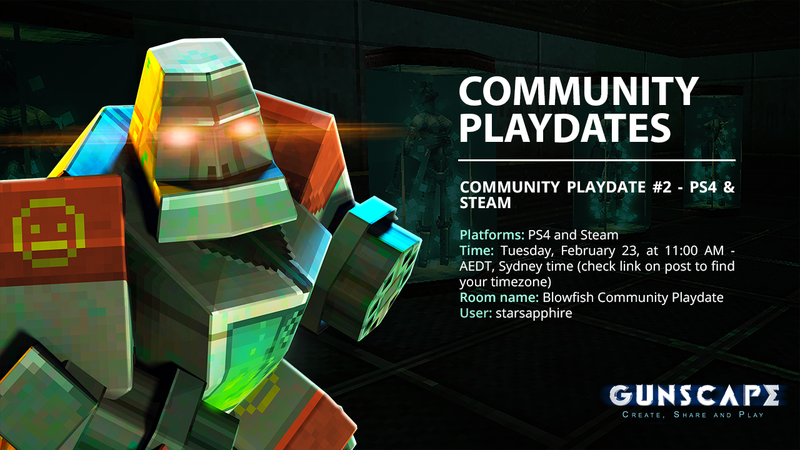 We’re going to be a bit busy during the lead up to RTX Sydney, so the playdates will officially start on February. We picked the most popular date and time according to our polls (Tuesdays at 11:00 AM - AEDT, Sydney time), but if this doesn’t work for the majority, let us know! We’ll also be announcing every playdate here (and on social media) a week before it happens. On Tuesday, February 6 at 11:00 AM - Sydney Time (or PST: Monday, February 5 at 4:00 PM; or GMT: Tuesday, February 6 at 12:00 AM, midnight; or check for your timezone), we will make a room in the game a room to play a few community-made maps (from our Featured Maps mostly, but we also take requests!). The reasoning behind this is that Gunscape has crossplay between PC and consoles, but not between consoles. We’ll try this weekly approach for now, but the schedule might change as we go, depending on how the first playdates go. Welcome to the 8th edition of our Featured Maps! We’re on time this time haha! We still had quite a few maps to test though, so we’re happy to see that you all are creating many maps! Remember to send us suggestions as well, even if they’re not recent. We want to make Featured Maps a nice mix of old and new maps. If you want a map with a lot of action, then this one is for you! You’ll need a quick aim or good reflexes with this one too, as you won’t only encounter a lot of enemies, but the map doesn’t give you much space to run around or hide. But don’t worry! You’ll have just enough ammo, health packs and weapons to fight your enemies, especially at the end, but we won’t spoil that part. Let’s just say it’s a good way to end the map. This is quite a fun and nicely design arena! Think of it as a castle in the middle of the air, but the castle is this inside area that simulates the offices of a corporation (as the name says). Outside of it, there’s an open arena, or well “open”, because this arena is in the middle of nowhere, so if you fall here, you fall to your death, and trust us, falling is quite easy when you only have narrow bridges with a drop to one side and a pit of acid to the other one. And on top of everything (literally on top, winkwink), there’s a platform with a few pleasant and unpleasant surprises. This is also a classic map. As the map says, the main goal of this map is to escape where you are. If you like maps with puzzles, then you might enjoy this one. You need to follow certain steps to get keys and progress through the map, and for that, you will need to confront certain enemies to get to the keys. The design of the map itself is pretty classic, it will make you feel like you are in a nazi castle or fortress, and that you have to kill all of the soldiers in sight! This type of map is a classic. An arena with a few buildings and spots to hide, but mostly open. This “town” might remind you of a deserted western town, and it works like that. It’s also not a big map, so a couple of people might have fun playing a bit of hide and seek (or sniping), as well as a big group can play using the different (but small) buildings in the map. If you want a sort of “simple” map, but that works well and has an interesting look-and-feel, this one might be for you. Welcome to the 7th edition of our Featured Maps! And sorry for the delay, but we had a lot of maps to test. It looks like you all have been busy making new maps during the holidays! Now that the holidays are over, our Featured Maps come back to a regular schedule (every 2 weeks), so remember to send us suggestions! This map is just what you’d expect from a collaboration between some of our most dedicated creators! I had high expectations when it was pointed out to me, and it certainly delivered! The map has an interesting and immersive story, and the look-and-feel of the map helps that. Basically, you’re in a massive spaceship and you have to investigate what happened to the crew there. The map isn’t exactly open-world, but it will give you that feeling, as you have different places you can investigate at the same time, so you can choose your own path! Plus, there’s quite a bit of action and enough weapons and ammo to survive. You definitely wanna give this one a shot! This is the first part of a campaign that consists of 3 maps. You might think that the first one is a little bit short, but it’s packed with action and a quite nicely designed environment, and stay with us right here, because the other maps of this campaign are longer and we’re sure you’re gonna like them! As most of LoopyFun’s maps, this map will definitely make you feel like you’re in a Bond movie or the old Goldeneye games. This is the second part of a really interesting campaign. With an immersive story about an outbreak and zombies, you find yourself trying to escape a building that has a lot of enemies (seriously, you’ll have a lot of action!). You’ll get enough weapons, but you’ll have to be careful with your ammo or you’ll run out at some points like I did. This map has a nice design and the story will surely wanna make you play more of it! This map is massive. Like capital letter massive, or at least it’s for an arena map. The map is contained so you can’t escape it, but we would still recommend playing this with a large group of people, or the map would become hide and seek (but if you wanna play like that, go ahead!). As the name of the map indicates, there’s a high tower in the middle that hides a few weapons, you miiight wanna take a look! As the name of this map says, this map is basically two forts divided by an arena! While we think this might work really well for a Team map (wink wink creator! ), it also works for it’s designated category. You can get weapons and hide inside the forts while trying to snipe your opponents, or you can also run into the arena and fight everyone there! French-speaking community, this one is for you! This map is both in English and French (and uses our NPC feature quite well. The map is also well designed, with not only an interesting plot, but more than anything, a really good look-and-feel and design of the map itself. The highlight might be the series of vents that um… might not be good for claustrophobics, but those vents look really believable and make the map layout a lot more fun! And of course, there’s a bit of action here as well, so there’s something for everyone.